Built a u shaped bunk in the back end - takes a lot of space, but with a table in the middle that fits in down in the u when not in use, there is a big double bed in back. Since I am 6′3″, I found that the commercial Sprinter retrofits have bunks that are just a little short for my tastes. The van is not quite wide enough to sleep crossways - for me anyway. Got some 5 inch foam and we are covering them in waterproof material first - just in case of a wet dog. The cushion for the table is a backrest in the back when used for sitting. The waterproof covering is shown here, there will be grey Polartec (polarfleece) over. Notice the storage underneath the bunks. For now, it is just perfect for a bunch of milk cartons and Rubbermaid containers to hold things in various catagories. The 1 x 2’s will keep them from sliding around. 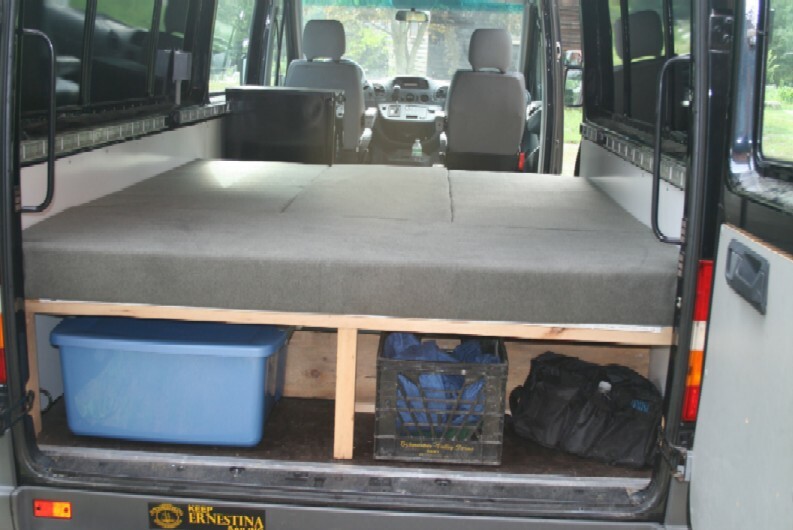 Here is a photo from the back with the polarfleece set up as a big bed. The refrigerator is visible on the left. 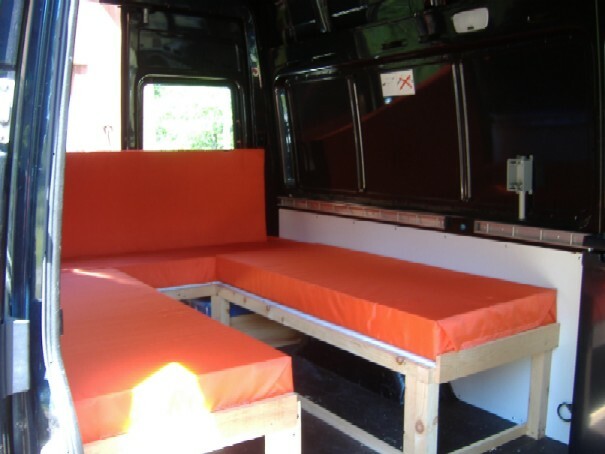 The wall covering on the sides of the bunk in the lower part of the van are a white masonite. Under that I put 2 inches of styrofoam and foamed the joints with spray foam. Insulation is for heat (cold) as well as sound. I m not crazy about the masonite, most of it is out of sight. We finally decided that 1/4 inch oak plywood will make a better finish for the inside walls of the van and we started with some on the sliding door. It has 3 coats of polyurethane on the face and one on the back to seal it. The van framing is near the center of the photo and the wood on the right shows how it is fitted. Next comes the insulation - 2″ of foam and “Good Stuff” expandable foam to fill the joints. Wall with 2″ insulation - ready for paneling. The 1/4′ oak plywood is going in. Started making a cabinet for the area forward of the driver’s side bunk and just in back of the refrigerator. It will be about the same height as the refrigerator and will be used for galley storage - food and pots and pans. The 1/4 inch oak plywood is used on the sides and the front framing is white oak. Getting ready to build the top and the door. Maybe be able to find the right sized plastic storage boxes to fit - or build shelves. The box next to it is the Fantastic Vent Fan that will go in soon, the refrigerator will fit next to the cabinet in that spot. Have to fasten the LED’s and put one more piece of oak plywood on - then get some strips of rug to make the curve. 4/20 Got some rug and here is a test fit along the top passenger side corner. After the rug came the simple shelves. It would be nice to build airplane type overhead cabinets, but these closet shelves are much lighter and simpler, and easy to take out. We will have to just use them for clothes - nothing heavy. Wih the bags on shelves, they look like this. Bungee cord is a big help. Looking forward, you can see that the gally cabinets are about done. There is one on each side of the refrigerator. The aft one has a microwave on a sliding shelf, and the forward on has a crockpot in the top compartment.